Hurrah! Hurrah! Found this tremendous recipe and it turned out brilliantly. All you chocolate-mint lovers out there, hang on to your seats coz this will blow your mind! No baking required, so all you non-bakers feel free to tune in as well. When I saw this recipe I knew this was something I had to try out and share on my blog. 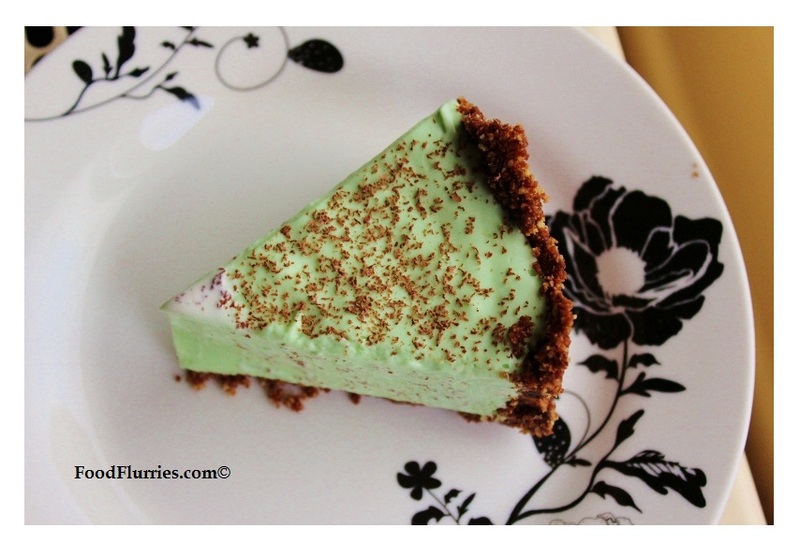 I looooove chocolate-mint ice cream, so the idea that you could actually turn this into a cake really intrigued me. Make sure you have a springform cake tin. If you’d prefer to have this in a pie then just use a pie tin instead, and top with copious amounts of whipped cream. 1. Grab a packet of your favourite chocolate biscuits. In my case I bought ‘Brownie Biscuits’ and they were slightly fudgey in the centre … YUM! … but a little too fudgey for the crust so I mixed it with about 5 regular digestive biscuits. Place them in a food processor to turn them into crumbs. Don’t have a food processor? Then place them in a plastic bag and bash them with your fists ~ an excellent stress reliever. 2. Melt the butter and pour over the biscuit crumbs. Mix together until they resemble wet sand. Spray the inside of your tin with a thin coating of lubricant to aid in the unmoulding process. Now line the bottom and the sides with the cookie crumbs as you would when making a cheesecake. Place in the fridge to chill while you get the filling ready. 3. Place the milk in a saucepan over medium heat. Just before it boils add in the marshmallows in batches, waiting for the first addition to melt before adding the rest. The mixture will become quite frothy. Take it off the heat and let it cool completely. To make it set quicker place it in the fridge for 30 mins. 4. Remove the marshmallow mixture from the fridge, give it a stir with a whisk and then add in 1 tbsp of creme de Menthe and 1 tbsp of creme de Cacao (or any peppermint and chocolate liquor of your choice). If you happen to only have clear peppermint liquor then a green food tint can be used to achieve the right colour. 5. Now place the whipping cream in a mixing bowl and whip on high speed until thick and fluffy. I would say take it as far as it would go, but don’t turn it into butter. Add the remaining 1 tbsp of peppermint and chocolate liquor to the whipping cream. 6. Fold the flavoured whipping cream into the marshmallow mixture. Pour everything into the biscuit shell, cover with cling film and chill thoroughly in the fridge for at least 4 hours. Garnish with grated chocolate and whipped cream. The first time I made this I “cleverly” omitted the chocolate liquor, thinking that the biscuit base would be chocolatey enough to carry the flavours … but boy, was I mistaken. The full force of pure unbridled peppermint hit me; it was as if I had taken a bite of a mouthwash in gooey form. So please, a word of caution : Don’t forget the chocolate liquor, and put a generous amount in as well. And with that I wish all of you the best of luck replecating this recipe for yourselves.